McAuliffe follows the PBIS (Positive Behavioral Interventions and Supports) framework. Critical elements of PBIS include: teaching and promoting school-wide behavior expectations, consistent responses to problem behaviors, and use of data to make decisions. 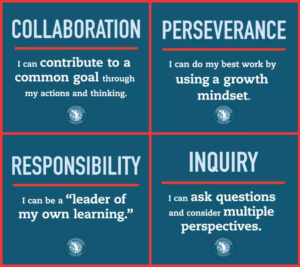 This work aligns with a few important EL Core Practices: Creating a Community of Learning and Fostering Habits of Character. HOWLs are part of the PBIS framework and are essential elements to McAuliffe’s approach to behavior and academics. Teachers integrate the school’s HOWLs (collaboration, inquiry, perseverance,responsibility, and kindness) into overall curriculum, daily lessons and individual interactions. Starting in 2018, McAuliffe has begun implementing Matrices throughout the building so our HOWLs live and breathe in every aspect of McAuliffe. Kindness was also implemented as a Character HOWL. Scholars are not graded for this HOWL but it is utilized, like the other HOWLS, as a guidance for scholar behavior and effort. Scholars self-assess their HOWLs during scholar-led conferences and passages. HOWLs cards are passed out to scholars when they are modeling the school’s Habits of Work and Learning and expected positive behaviors. HOWLs Awards are given to scholars who are Meeting on each of their HOWLs at the end of the trimester. HOWLs Improvement Awards are given to scholars who made substantial gains on their Habits of Work and Learning from the previous trimester.